Some centuries after monasteries first appeared they begun to have cloisters, which came to constitute, on the architectural plane, one of the characteristics elements of the same monasteries, given an unmistakable planimetry. Often the monasteries have had more cloisters, so that all the monastic building came to constitute a whole of claustral enclosures. Different styles (Romanesque, Gothic, Renaissance, and Baroque) have also left on the cloister his distinctive imprint, as like other characteristics due to the different regional or national influences. The form of the cloister is for most square or rectangular, but the dimensions are a great deal different, as the relative architectural elements (parapets, arcades, arcs, columns or pillars), as well as decorative ones, like the possible pictorial cycles along the walls. Finalpia Abbey has two cloisters, determining a fairly wide building, not imaginable from the outside. The whole is slender and harmonic, sober and elegant, with an interaction(in the first cloister) of straight lines and curves constitute from the ferrules of the arcades and from the straight upper frame. The formulation of the whole retrace, as concern the arcades, to classical models fully affirmed, given also that the construction continued for a great part of the sixteenth century, as attest the date of 1563 engraved in the South West angle of the first cloister that wants evidently mark an important date in the phases of the same construction. The renaissance character of the whole finds ulterior confirmation in the definite function of support of the columns, as also in their modest taper, while the capitals present a discreet variety of forms with ornaments of leaves and stylized volutes. In the first cloister, of the same epoch of the construction is the shaped portal, carved and painted that gives access to the second cloister, while to the center of the east wall a beautiful arcade in stone (Pietra del Finale), discovered only in 2000, constitutes the chapter house’s door. In the first cloister the sixteenth century original sides are two, in the second only one, in prosecution with the original door of the first. 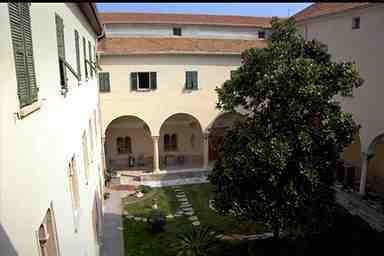 At Finalpia, therefore, the construction of the cloisters was interrupted for four centuries, halted, almost in an emblematic way, with the decline of the’Del Carretto" marquisate (second half of the sixteenth century) that a century before (1476) had sponsor the foundation of the monastery, as to point out that one phase of the monastery's history was concluded. The engraved coat of arms on a marmoreal plate in the first cloister is of "Del Carretto"
In the monasteries the cloisters develop from now on one organizational function of space in the sense that they command the distribution of space so that all comes together in the cloisters and all radiate from them. It results an assembled and multiplied space of walls and succession of arcades. The cloisters besides have a practical function to assure a covered connection between the different rooms of the monastery also in case of bad weather or during the winter season. To this respect the cloisters of the northern Countries are closed by glass partitions. Deeper it is their symbolic meaning. It contemplates to get an organized and square space in which the man recovers his internal dimension fully and facilitate in his commitment to "live in oneself," escaping from the dispersion of the outward appearance. Here the reason why the more life is restricted- like in the case of the Chartreuse- so much ampler are the spaces needed; and the Chartreuse, is known, offer vast cloisters around which they place the monk’s cells and they carry out also the function of cemetery. In them in fact the monks are buried with a cross without name because the Lord that will call them in the last day knows their name. But the whole monastery often is described by the monastic tradition like a sepulchre in which the monk is deposed waiting for the resurrection. 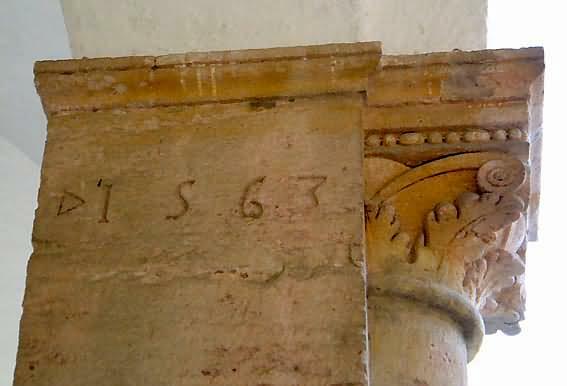 Practically the sense of flow of time is often recalled in cloisters with the presence of sundial or with the list of the months and of the seasons painted on the walls. 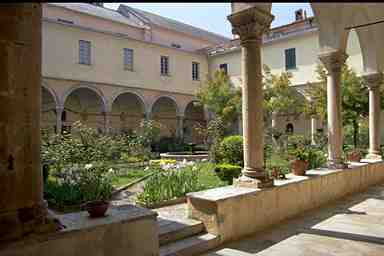 The symbolism of the cloisters finds his fuller expression in the reference to the paradisiacal garden. That’s why there are flowers, fountain or a well, the water symbol of life ( recall the four rivers of the terrestrial heaven) and, close to this garden in which the desert has bloomed, is situated the church of the monastery, symbol of the true Jerusalem the celestial one. In reality, beyond the monastic buildings, from the cloisters is seen only the sky. Paradisiacal garden, of the found again heaven, and garden of the resurrection, of the expected resurrection, are therefore the principal symbols that intertwine in the cloisters also communicating to the more distracted visitor a ineffable sense of peace and a call to the superior realities of the existence.